Muscat’s new passenger terminal is due to open on March 20, with new routes with Oman Air scheduled to Casablanca (June), Istanbul (July) and Moscow (October). 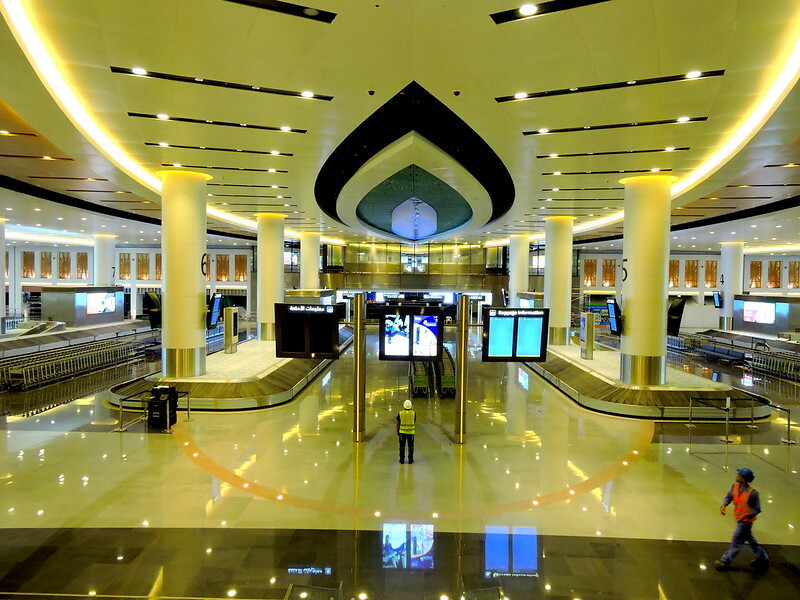 Business Traveller Middle East was given an exclusive tour of the new facility, which is on a grander scale to the 45-year-old airport, designed to handle 3.5 million passengers a year yet now handling twice that number. Capacity at the new terminal will initially rise to 12 million a year. Construction is scheduled to finish by March 7 – duty free and lounge fit-outs are in the final stages – ahead of the full switch in operations on the afternoon of March 20. From the multi-lane approach roads – the terminal can be accessed via three roads – and separate drop-off lanes, you’re struck by the sense of scale which contrasts sharply with the existing airport. Short and long-term car parks provide space for up to 800 cars. A Bechtel-led consortium has overseen the terminal’s design and construction. Oman Air premium passengers turn right into a separate check-in area (A) with 12 desks and guests can avail of comfortable seating and soft drinks. First and business class guests can access self check-in kiosks, electronic gates and three security machines. Alongside Oman Air’s lounge, two other lounges are available for international passengers and stop-over passengers can rest their heads in a 90-room hotel. Check-in areas B to G are laid out one after another (12 counters in C and D exclusively for Oman Air), eight palm trees serving as a dividing centrepiece. Beyond immigration, where each counter is separated by semi-circular wooden fixtures, passengers spin off into A, B or C piers which are designed on different themes (desert, mountain, sea). I walked most of the length of A in five minutes and it doesn’t appear to be as long as some Gulf airports. The biggest single physical change is the contact stands and airbridges (carpeted) which means most passengers no longer need to catch buses to stands, although there are some remote facilities. This will not only be welcomed by passengers but carriers who should improve transfer flow – around 70 per cent of all passengers are transiting – and on-time performance. Two gates are A380 compliant. With plentiful glass and marble, it has the look and feel of most international terminals, but mashrabiya designs – some are projected onto floors as you’re walking through – lend an authentic Omani touch. The four-pronged, rising steel fixtures are prevalent, especially in the check-in area, and they support the wave-like exterior, which window seat passengers will experience best on arrival or departure. The arrivals hall looked the most attractive aspect, from what I could see, with an oval light design centrepiece. The capacity increase coincides with a new push from Oman Air, which is receiving new aircraft and launching new routes. It recently received its second B737 MAX – it has 30 -8s on order – and the next three are scheduled to arrive this summer. New routes to Casablanca (June), Istanbul (July), Moscow (October) all raise the prospect of new transfer and O&D business and key routes are also being considered for upgrades; the Dreamliner is being lined up for twice-daily London Heathrow services this summer, for example. In February, a new holding firm to house the country’s transport assets was established which will integrate strategies. Read the full feature in Business Traveller Middle East‘s March edition.